Mary Alexandra Agner is the author of the poetry collections The Scientific Method (Parallel Press, 2011) and The Doors of the Body (Mayapple Press, 2009), as well as Olivia & the Experiments, short stories funded by her Kickstarter backers to subvert scientist stereotypes with LEGO fanfic. Her work has appeared in Astropoetica, Eye to the Telescope, Goblin Fruit, inkscrawl, poemeleon, Stone Telling, Strange Horizons and other magazines too numerous to name (a complete list is here). Her advanced degrees include Earth & planetary science and creative writing. She is a freelance science writer working with Under the Microscope, Argonne National Laboratory, and other markets. Idea descends, put words on paper, revise until better. Getting ideas does really feel like walking through a mess of insects while I’m in web mode: they just come from the air. I usually can’t start on one until I have a phrase or a voice saying something; it’s always the sound of the words that gives me the energy to break into writing. It takes a lot of practice to keep writing once the voice or sound have spun themselves out, but if I know that the piece isn’t done, I just switch into writing down what *should* be going on, questions if I’ve got nothing else. And when I say a lot of practice, I mean years of it. This is the disheartening part because it’s like the Muse, should you believe in her, has glanced out the window, taking her gaze off of me, training wheels all gone, and wouldn’t it be easier just to fall off? I rely entirely on my ear to tell me when a piece has been sufficiently revised: I read and re-read listening for unpleasant jangles. And then re-fashion the sound of the jangles. 2. Can you say a little bit about the genesis of your most recent book? 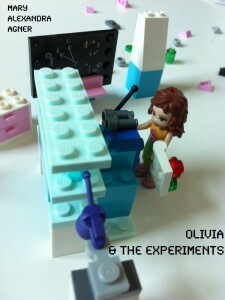 Olivia & the Experiments has two sources, a personal one and a public one. I was intrigued by the new LEGO line of blocks “for girls” because one of the characters has an inventor’s workshop and I desperately wanted her to be the kind of girl who did real science with it while wearing pastels and hair ribbons. The public source are my Kickstarter backers, who funded me to write four stories about Olivia doing real science showcasing that many traits typically considered feminine are a strength in science, such as communication and collaboration. Additionally, the backers dictated the science in the stories as well as who made cameo appearances. Olivia has a run-in with an NMRI machine, gets up close and personal with an onion nuclear membrane, resurrects Dorothy Hodgkin’s Nobel-prize winning work, and solves a puzzle with a only a telescope and clear seeing. 3. Do you think writing helps you to understand more about yourself and the world, or is advancing as a writer more about learning how to communicate the things you already know? I have learned the hard way that “no surprise in the writer no surprise in the reader” is true. I often think of interesting things to say but I have found that while they may feel like conclusions, I need to write *from* them into I know-not-what. Into the surprise. Writing clarifies things for the writer—not necessarily the things it communicates to the reader!—but the writer must learn from that act, not just regurgitate. This was written by joannemerriam. Posted on Tuesday, April 23, 2013, at 3:40 pm. Filed under People I Know, Poetry, Um... yeah. Tagged Intermittent Visitors, Mary Alexandra Agner. Bookmark the permalink. Follow comments here with the RSS feed. Both comments and trackbacks are currently closed.